“Above all, I still wish to speak your name,” says the poet who addresses and seeks communion with a specimen of an ancient whale. 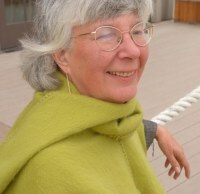 In psalm after riverine psalm here, whether her subject is tongue or Indian summer or the eye or box turtle and moon or mountain or love, Karla Linn Merrifield continues her quest for the center of poetry itself, the primal, and we are glad, by way of her voice, to hear and behold, to draw closer. 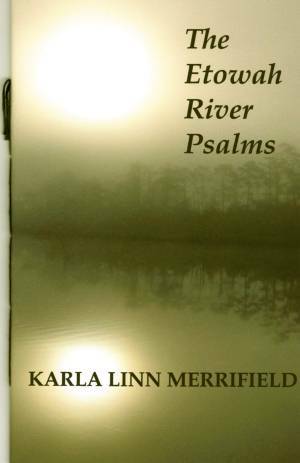 At first glance, Karla Linn Merrifield's title, The Etowah River Psalms, may have religious connotations, but for this poet, it is nature that is sacred, and she worships it with profound sensuality, sweeping us downstream on the iconic Etowah River. She writes, “I am your innermost river / throbbing with wild currents within you.” This line epitomizes the rush, the pulse, of her lyric style as she celebrates our kinship with water and nature and with each other. As we participate in this journey, Merrifield asks us to become a river, a whale, a moon jelly, a human lover; to let go and drift and tumble in her imagination. Rivers figure prominently on my personal interior map of life. I was born in a confluence town where the Monongahela forms. By the time I was seven or eight, I'd learned that it flows atypically north to a point where it partners with the Allegheny to create the Ohio, a river destined for the Mississippi. Over the years since then, in my travels on my home continent and in Europe, I have met many other rivers, great and modest. As a college student traipsing through Austria, I speedboated on the Danube. Several times I've strolled the banks of the Thames in London and the bancs of the Seine in Paris. One summer I took a tour boat down the Reine near Frankfort and ambled the Ponte Vecchio across the Arno in Florence. Here in North America, I've stood near the source of the Mississippi in Minnesota and near its mouth in Louisiana and crisscrossed it on a dozen bridges north and south. I've kayaked several stretches of the Missouri and watched windsurfers along the Columbia. I've seen the Yukon from a car and a motorboat and taken a jet boat up the Snake into Hell's Canyon. I've rafted a long stretch of the Middle Fork of the Salmon River. Canoed the Rio Grande. Stopped to listen to spring melt tumble down the Humboldt. Fished the Russian River (of Alaska, not California). And for fourteen once-in-a-lifetime days, I rollicked down the rapids on the Colorado through the Grand Canyon for 213.5 wild miles on an eighteen-foot dory, a cockleshell of a craft in the white water. It was during this expedition that I also was swept away on the Little Colorado River, there brushed up against boulders in the stream, brushed up against death. Close to home, I make a pilgrimage each autumn to Niagara Falls to watch that river (which is technically a strait) plunge through mist and rainbows into the gorge on its way to Lake Ontario and on to the St. Lawrence River to the Atlantic. In Canada, where I've made my way from the eastern terminus of the Transcanada 1 highway in St. John's, Newfoundland, to its western terminus in Tofino on Vancouver Island, I've encountered dozens of rivers powerful and famous (like the Fraser in British Columbia) and small and relatively inconnu (like the Souris in Manitoba). Notably, twice I've crossed the mighty Mackenzie of the Northwest Territories on a ferry-the only way to and from Yellowknife once the ice bridge melts in spring. The Etowah River, a modest one just a short drive northwest of Atlanta, first came to my attention in October 2004 when Georgia poet Beau Cutts sent me his poem “The Etowah” as a way to introduce himself during our nascent correspondence. I was moved by the poem and thought it a fine, fine piece of poetry. But it wasn't until I taught the poem a year later in my college freshman writing class (one that focuses on the environment and humanity's relationship to it) that the poem-and its river-swept me away. The poem electrified several students; they saw things in it I'd not seen in my several readings of it. And that in turn made me take a much closer look at “The Etowah” and the Etowah River. One sunny September morning, I remember plucking a line from “The Etowah,” as if pulling a thread from a tightly woven tapestry and playing with it, scribbling, composing. I began a reweaving of “Migrants crack open/our first sleep” into a poem that became “Mercy Flight.” A few days later I tugged at another line in “The Etowah” and wove a second poem. Then a third borrowed line, a third poem. By then it dawned on me: Cutts's poem and his river were carrying me away; I'd caught the current and was headed downstream at a dizzying pace, writing poem after poem with line after line from his master poem until the poems had run their course, were complete. These many months later, I am still amazed by the phenomenon, that a river and a poem about a river could captivate me so thoroughly. It remains a mystery; I let it be. No, I've never seen the Etowah River, but I believe in it. It has helped me, as W.S. Merwin says, “to keep time with no time.” To me the Etowah is as timeless as the Nile, as the god Meander's Meander River in Asia Minor of ages ago; Beau Cutts has made it so for me. of your blood, of your flesh. me pounding in your fingertips? I am the idea of ideas. I give you vital tides. You begin to write. and know how to say it. in every cell of your being. A poem appears on the page. I am in you, ubiquitous, mythic, alive. 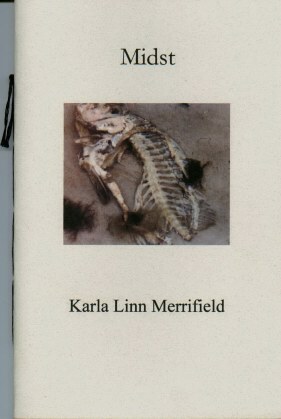 A Pushcart Prize nominee, 2009 Andrew Eiseman Writers Award for Poetry recipient, and 2009 Everglades National Park Artist-in-Residence, Karla Linn Merrifield has had poetry appear in dozens of print and online publications as well as in many anthologies. She has four books to her credit (Midst, Godwit: Poems of Canada, Dawn of Migration and Other Audubon Dreams, and THE DIRE ELEGIES: 59 Poets on Endangered Species of North America). She is poetry editor of Sea Stories (www.seastories.org), book reviewer and assistant editor for The Centrifugal Eye (www.centrifugaleye.com) and moderator of the poetry blog, Smothered Air (http://smotheredair.yuku.com/). 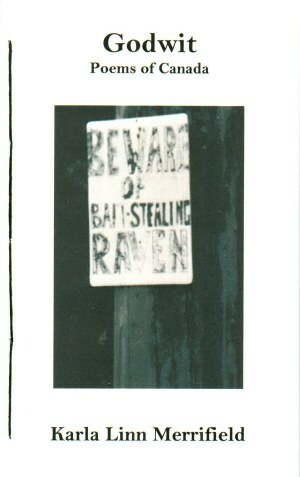 She teaches at Writers & Books in Rochester, NY; her blog is http://karlalinn.blogspot.com. In love with Canada since developing a crush on a visiting Canadian Cub Scout years ago (we were both 7), it's no wonder to me that Karla Linn Merrifield's captivating Godwit snatched at my heart---I identified with her covetous attachment to things and places Canadian early in the introduction---and it wouldn't let go, the last empathetic beats of me continuing to resonate in the northern needles, cones, native elders, butterclams and roe inhabiting the final poems. Karla Linn Merrifield may not be an ex-patriot, but her literary sense of Canada-its landscape, its people, its essential there-ness-is as acute as though she had spent her entire life above the 49th parallel. Or perhaps more acute, because, as with anything seen from the outside, her focus is sharpened by distance, honed by reverie, and described by detailed poetic sensibility. For Canadians and non-Canadians alike, this book is a treat to read-unrivalled by even the tastiest bite of cod cheeks . . . or Tim Horton's. the rising full moon and her wide Milky Way. between shore & shore, this today & that tomorrow. there, all there, positively there. if only in homage to its granite. of birch skin, dry curls of fern. the bared solid bone of North America. covered, uncovered, in cold briny water. of sweet earth every century. anything friable to my fingers. past my nascent senses into eons. I can't help it, won't help it: I hear voices. It's been happening over the past several years as I have traipsed up the backwaters & into the wilder regions of the North American continent. As I traveled, I left behind Ruskin's pathetic fallacy that had taught me to avoid imbuing the natural world with human feeling. I left behind the work of many modern poets who have used the pathetic fallacy to ironically emphasize the loss of communion between the individual & the natural world. But I stuffed into my backpack the belief that that communion could be regained & that the natural world could imbue me with its feelings. And it did. The process for the resulting poems I wrote of such close encounters was twofold. Being a creature of Western culture & having been a student of the scientific method, I lugged my guidebooks with me & took as my departure point the identification, the naming of the beings I met in field & stream. I nailed down the Linnaean nomenclature for each beast - and then I stared (as poet William Heyen first instructed me to do). I find that if I stare long enough, listen well enough along the unbeaten paths, the animals will speak, pleading their cause, informing the human condition. With this slim volume of poems I invite readers to hear what the carp, cod, halibut & others of their kingdom have to say. I invite my readers to commune, to be in the midst. of the strongest known natural adhesives. holding on, outlasting, yes, even death. otherwise, those old soul barnacles, those old lovers. Midst is a 32 page hand-sewn chapbook.